For a pasty girl of Danish & German decent, I crave Mediterranean food as though it is in my blood. Sometimes I get my fix at dinner, but most often it is at lunch time that I go out and track down what I’m jonesin’ for. For working where I do there are a couple of places that I commonly go for my fix – Firdous Express (Short North), Mad Greek (Whitehall) or the Pita House (Bexley). Of these places you are most likely to find me in Pita House. The price is right, the service is great and the food is delicious. Now I have been here A LOT and when I say A LOT, I mean A LOT. The guys behind the counter are always very gracious & helpful; and always laugh whenever I order my usual Chicken Shawarma Platter. 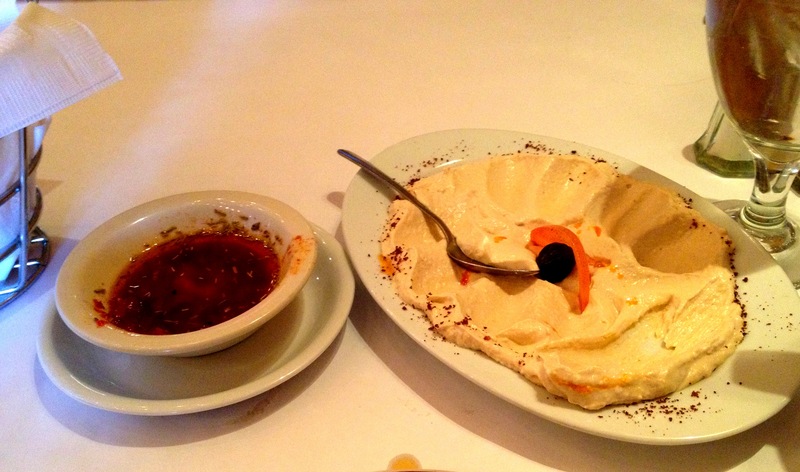 The platter comes with hummus, pita, chicken shawarma and your choice of two additional sides – and my usual consists of Jerusalem ‘salad’ and the cauliflower ‘salad’ sides. There are many things on the menu that I have tried and all of which are tasty to me, but this is my favorite and I like to tell myself that it is healthy since it’s chicken and not red meat… What? There is SOME truth to that! Anyhow, I have tried and would recommend any of the following, but not limited to: Baba Ghanouj, Hummus, Jerusalem Salad, Eggplant, Coleslaw, Falafel, Gyros, Chicken Shawarma, Turkey Shawarma, Chicken Kabab, and/or the Lamb Kabab. 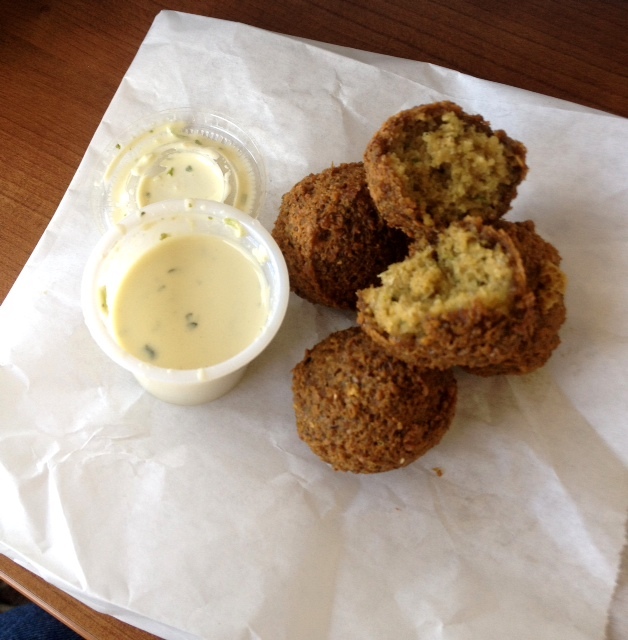 On this particular day I ordered the usual along with an order of falafel. (What? 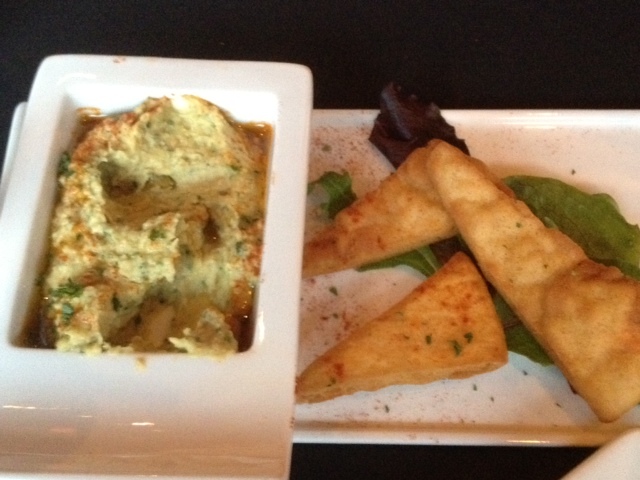 It may be fried, but it’s made of chickpeas & fava beans so it must be healthy too! 🙂 ) Let’s start with the falafel. It’s wonderfully crunchy on the outside and soft in the middle; and when dipped in the yogurt sauce that they give you they taste a little creamier, but without losing it’s lightness. Definitely in my top 3, only being surpassed by the Happy Greek (2nd) and My Big Fat Greek Kuzina (1st). So if you are on the hunt for a good falafel and not in the Short North or Upper Arlington, then I definitely recommend you stop by this place. 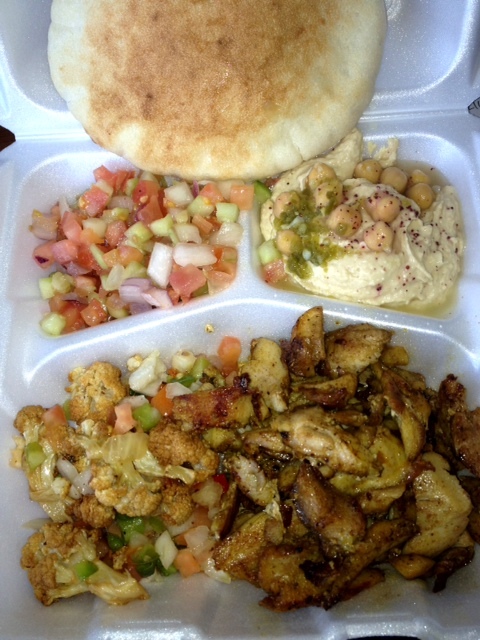 Then there is the chicken shawarma platter…ohhhh the chicken shawarma! Where to start? The chicken is perfectly seasoned, thin cuts of grilled chicken. I could, if necessary, just eat a helping of this without anything else – it’s just that good. The Pita House also makes an incredibly delicious garlic paste that I slather on when scooping up the chicken in the pita, the paste was mentioned in a previous post of mine on the Taverna (LINK). The hummus here is top-notch, deliciously rich & a smooth texture; and it is always topped with a couple garbanzo beans & fresh parsley. Then there is the Jerusalem salad, which I do not know exactly how they make this so damn good, but it is. Simple ingredients of cucumbers, tomatoes, and red onion make up this dish. The cauliflower side is another non-complex salad that mixes well together and pairs well with the other items on the platter. It consists of cauliflower, peppers, onions, olives, mushrooms and a touch of olive oil. This is a great meal for any lunch or dinner, as is everything on the Pita House’s menu. So stop on by Bexley to give it a try. I give this spot TWO THUMBS UP! Posted in All, Appetizers, Dinner, Lunch, Restaurant Spots and tagged Bexley Oh restaurant, central Ohio Mediterranean, Columbus lunch spots, Columbus Oh gyro, Columbus restaurant, gyro and hummus, Pita House. Bookmark the permalink. 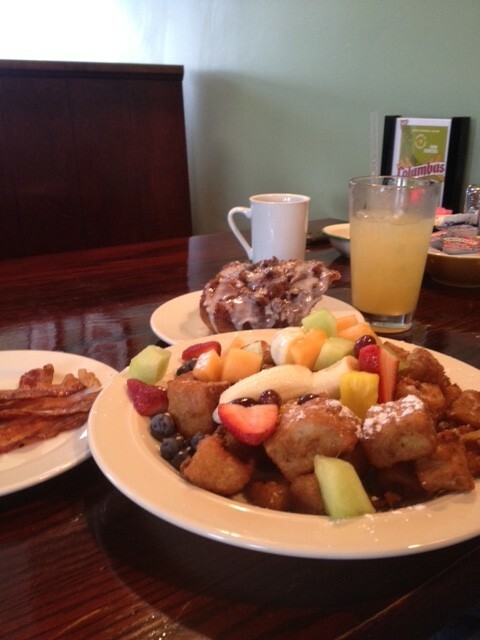 Explorer’s Club: A Brunch Adventure WELL Worth the Trip! I have always been a big fan of breakfast. In fact, I think it’s a family thing, as I can remember my mom making a BIG breakfast for dinner some nights. 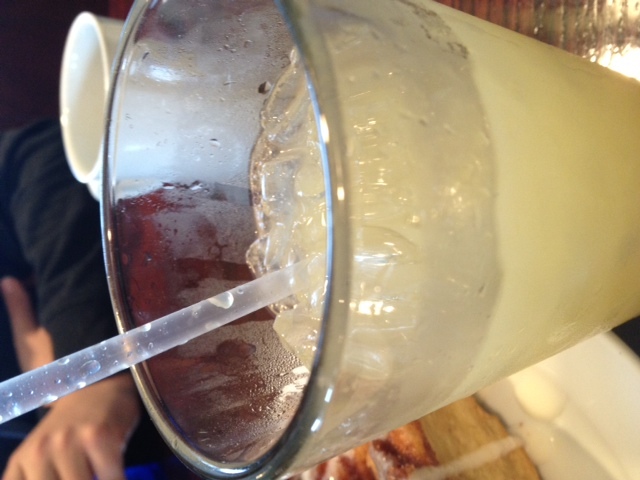 My love for it only grew once I became of legal drinking age – mimosas, bellinis, bloody marys, spiked coffee…YUM! Anyhow, as much as I love to daydream of fruity alcohol concoctions sometimes…back to the food! 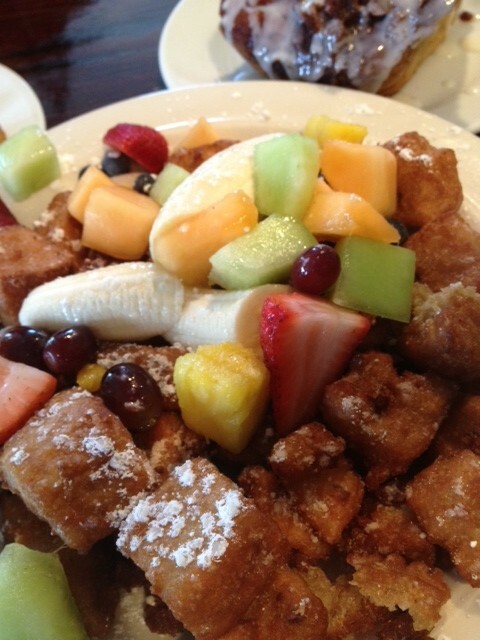 When it comes to breakfast it is the Explorer’s Club that I have CRAVED over the past couple of months, and more specifically it is their Cuban french toast w/fresh fruit that I really cannot stop thinking about (you know it must be love then). It’s a dish of these amazingly sweet and a little, crunchy french toast cubes, dusted with powered sugar and topped off with fresh fruit – pineapple, banana, strawberries and melon. This is the best way to spend a late morning on a weekend. Especially when you order a side of their bacon, a coffee, a water and any drink with some alcohol in it. Add in someone to spend the morning with for a good hour and a half or more to slowly drink, talk and eat your way to enjoyment. I’m not going to lie, these tasty, little bits kind of remind me of Burger King’s french toast sticks that I couldn’t get enough of as a kid. Now, for those of you who just read what I typed and are turned off – DON’T BE!! 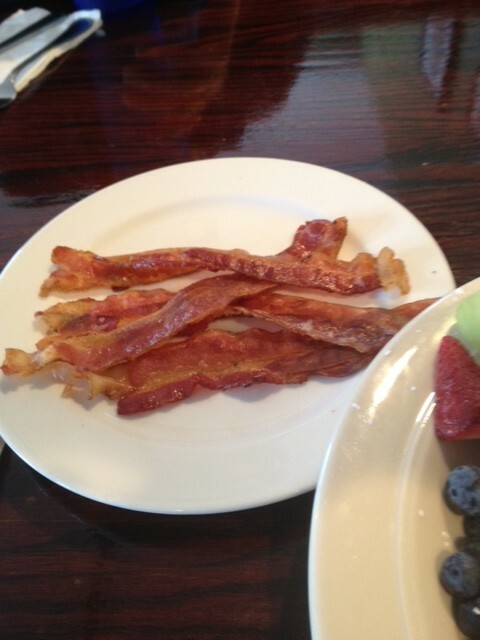 You will not regret this or any other breakfast item you select here at Explorer’s Club. 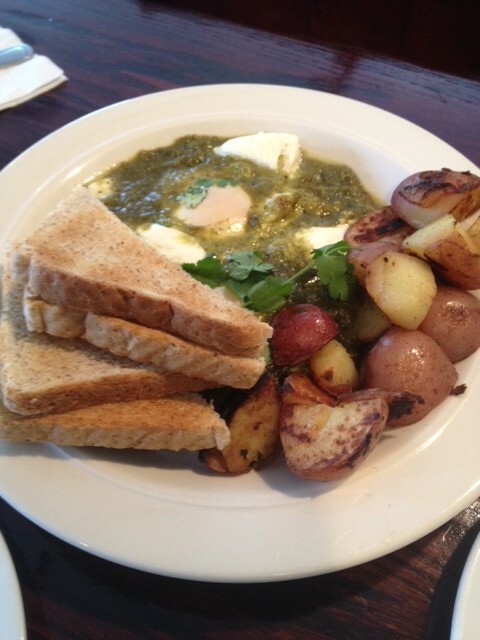 They really specialize in good Latin flavors with their dishes and while you can pick the fiery burritos or chilequiles dishes…I’d also recommend this special they have: eggs in verde sauce & mozzarella. Jason ordered this amazing dish, it comes with toast and breakfast potatoes, with some of their house made hot sauce (fire breathing hot) and one of their BIG Cinnamon Rolls (SOOO good, even the next morning with all of the sweet icing and a little spice with all that cinnamon) and he LOVED every bite of his breakfast too. But maybe brunch isn’t your thing, then Explorer’s Club is still your place. 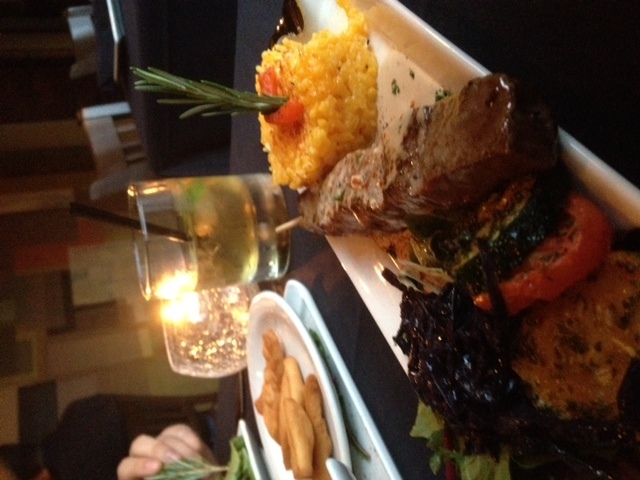 Their dinner is an experience too with amazing Latin flavors and even plenty for the vegetarians or vegans in your group (a.k.a. DORSEY). 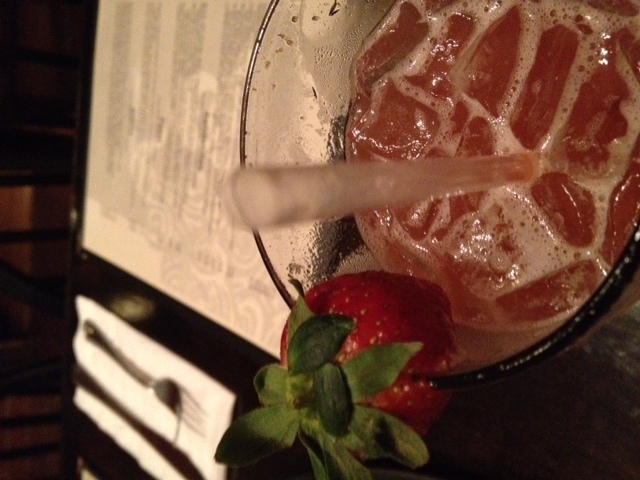 We started out with drinks and I tried one of their Strawberry Love Margaritas, which was refreshing and addicting! 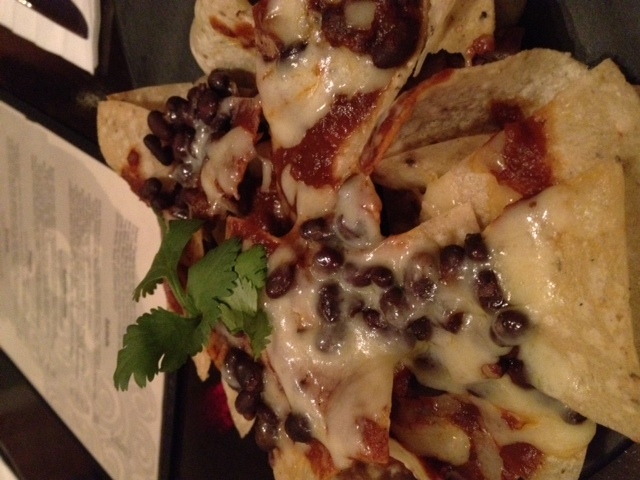 We opted to start with an appetizer even though we knew it may not have left us any room for dessert after our dinners… But who could resist nachos with black beans, jack cheese and their own chiptole sauce. (The perfect amount of spicy. They use this in a lot of their brunch, lunch and dinner meals and after one bite you’ll know why!) 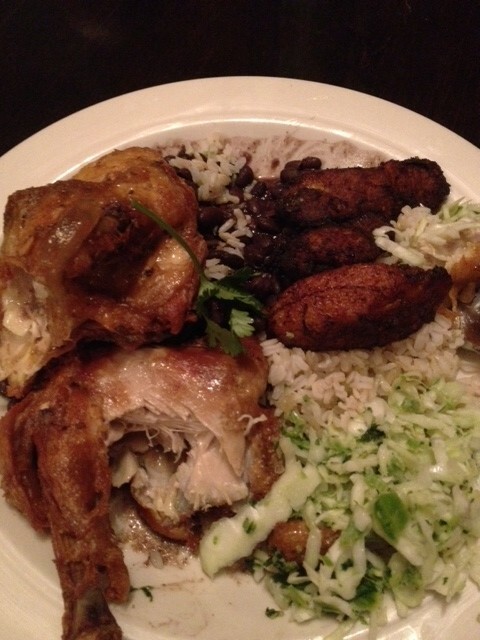 From there I got their Half Roasted Chicken with brown rice, jalapeno slaw and a side of plantains. As you’ll notice from the picture below, as soon as it landed on the table I had to try the chicken and didn’t make it to a photo first. The skin on the chicken is perfectly crispy and the meat inside is tender and juicy. Everything about this dish and trip to the Explorer’s Club was divine. Posted in All, Appetizers, Breakfast, Cocktails/Drinks, Desserts, Dinner, Lunch, Restaurant Spots and tagged Columbus brunch, Columbus Latin food, Columbus Oh brunch spots, Columbus Oh cocktails, Columbus restaurant, Columbus South Side, Explorer's Club, German Village restaurant, Merion Village restaurant. Bookmark the permalink. 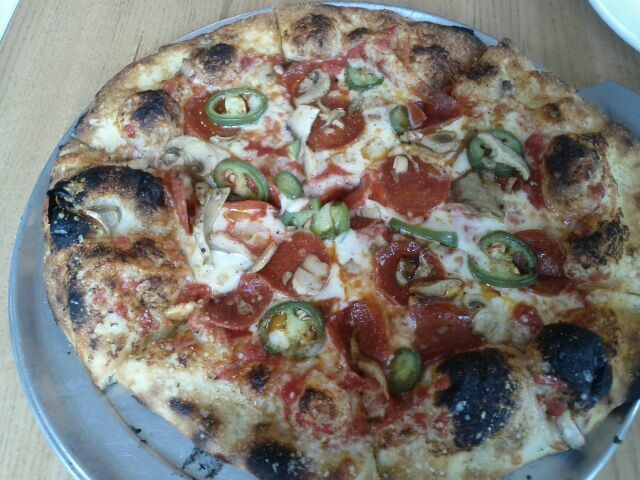 Harvest Pizzeria: The Way Pizza Should Be! The interior consists of a lot of neutral colors, natural lighting from windows, and a lot of wood – all things I am a big fan of! There isn’t a ton of seating, so get there fast, but business wise it was a smart decision on their part to start small & build up a clientele before expanding to a large place. 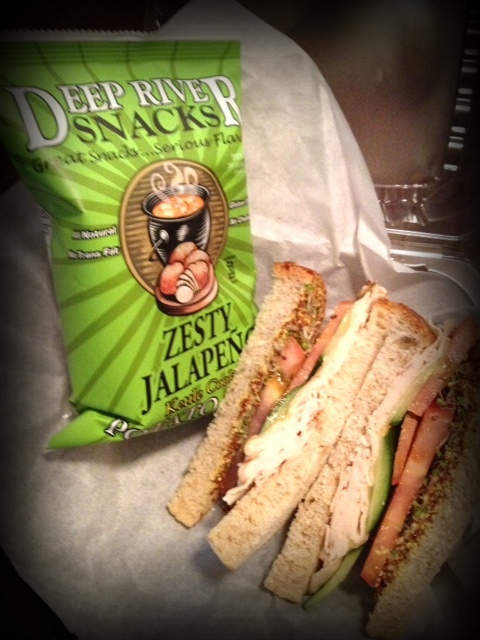 Anyhow, the ingredients are fresh and a wide variety of Ohio grown products to choose from. The pizza creations are baked in a wood-burning oven in the small kitchen – which you can see right into and watch them go to town on the dough. I could go on and on about wood-burning ovens, but I’ll digress…I just wish I had one of my own at home! Like Yellow Brick, the menu has a few specialty pizzas for you to pick from or they also allow you to create your own. 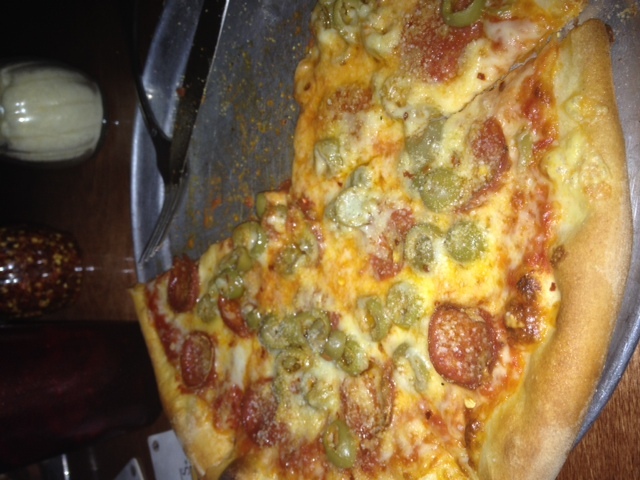 On this day Jason & I split a pepperoni, tomato sauce, mozzarella & provolone mix of cheese, jalapenos and mushroom pizza. DE-LI-CIOUS! If you aren’t starving when you get there, you will be as you sit down and smell the pizzas cooking. Now we did not get any appetizers while we were there but from the choices they have on the menu and the smiles on people’s faces sitting around us, as they ate them – it would be well WORTH IT to try them next time. With that said, it was a strategic plan to not order apps so as to save room for dessert. And eat dessert we did. 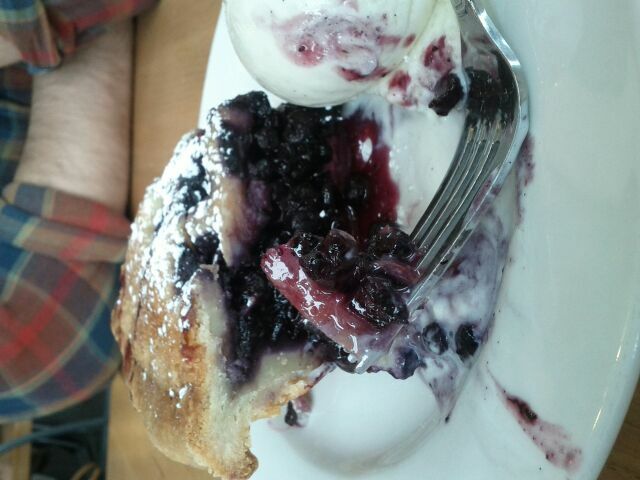 They have the BEST BLUEBERRY PIE I have EVER had (and for those of you who know me, you know just how much I LOVE ALL things BLUEBERRY!) 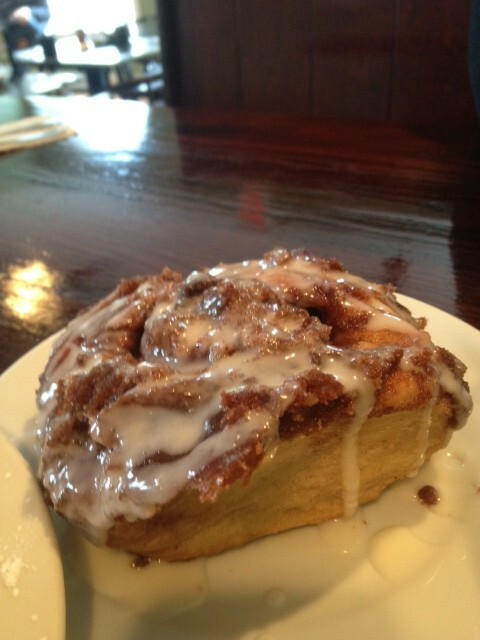 and with ice cream on the side…it was the perfect end to a perfect meal. Seriously though, you should try the pie. Apparently, the owner’s mother makes them all herself. TWO THUMBS UP to yet another fantastic German Village restaurant!! Posted in All, Desserts, Dinner, Lunch, Restaurant Spots and tagged blueberry pie, Columbus artisan pizza, Columbus Oh pizza, Columbus restaurant, German Village restaurant, Harvest Pizzeria, homemade pie Columbus oh, local ingredients. Bookmark the permalink. Lately, I feel as though I have really picked up my love for pizza again and ran with it. Luckily, it keeps me coming back to Yellow Brick – along with my new friend Abbey! 🙂 I really feel that it could be her true love for the food that has triggered me back into seeking good pizza in Columbus. THANK YOU ABBEY for bringing me back to pizza AND for showing me the light via. Yellow Brick. First, I love that Yellow Brick is located in Olde Towne East, it’s so close to work that I could walk here and such a treasure to top it off. You walk inside the place and you’re glad that someone knows how to properly utilize all of their window fronts. It also has gorgeous exposed brick, a bar that extends the length of the restaurant and plenty of seating. Next you will be delighted, if you are like me, at the first menu they hand you – pages & pages, upon pages of craft beers from around the U.S. on draft or bottled. However, if you are like Abbey and love a good Coke from Mexico, you’ll be set here too. The menu allows you to select one of their artisan pizza favorites or get creative and design your own. I like using classic ingredients to design my own. So I ordered a small cheese pizza with their Rhode Island sauce (a classic tomato pizza sauce with tasty olive oil drizzled in – can’t go wrong here with this sauce), pepperoni, green olives and then topped with shaved Parmesan cheese. Now Abbey loves feta cheese on her pizza from Yellow Brick, so she gets the small cheese pizza, the Rhode Island sauce (her favorite, which I copied off of) and then topped off with feta. Everything is so good that before you are even aware you have hoovered down half of your piping hot pizza. I’ve only been twice, in March, but I’m sure that I will be one of their regulars in no time! This definitely gets TWO THUMBS UP!! Posted in All, Cocktails/Drinks, Dinner, Lunch, Restaurant Spots and tagged artisan pizza, Columbus pizza, Columbus restaurant, craft beer, dinner spot, Olde Towne East, Yellow Brick Pizzeria. Bookmark the permalink. All the techniques are right, the plated food looks fabulous, but when it comes to taste it doesn’t blow your mind or seem very original either. To be fair, it is hotel food @ it’s BEST! The experience wasn’t too great from the moment we told them we had reservations. Being the conscientious diners that we are, Jason booked us reservations at Sidebar 122 through Open Table (a service we use often) and did have a special request for a window seat – we are both fans of people watching and natural lighting. This apparently annoyed the host, who told us when we got there that he felt that this was like paint telling Picasso what color it is and where to put it on his painting…dramatic to say the least! So after the very warm welcoming, the nice hostess took us to our table, by a window. Our waitress seemed a little scattered but was dear and very helpful to us as new diners at the restaurant. To start, they bring everyone a delicious serving of hummus and fried pita (and you all know by now how much I love hummus). This was by far the best thing that I ate here and it was damn good. Next we ordered cocktails – me a Jack & Ginger and Jason got a Negroni. He thought his was a bit strong, but wasn’t complaining. I thought my drink was a little watered down (possibly because our waitress apparently forgot to come back to ask me if I wanted ginger ale or their ginger syrup, which they didn’t recommend, in my drink – so who knows how long those ice cubes sat in that whiskey) and the ale had no fizz to it. For dinner, I ordered the Roasted Beet & Blue Cheese Salad and the Grilled Beef Tenderloin Skewers (although there is only 1); and Jason got the House Salad and the Pork Filet Mignon. He found his salad to be good and better than expected when he wasn’t sure what a pecan dressing would taste like. 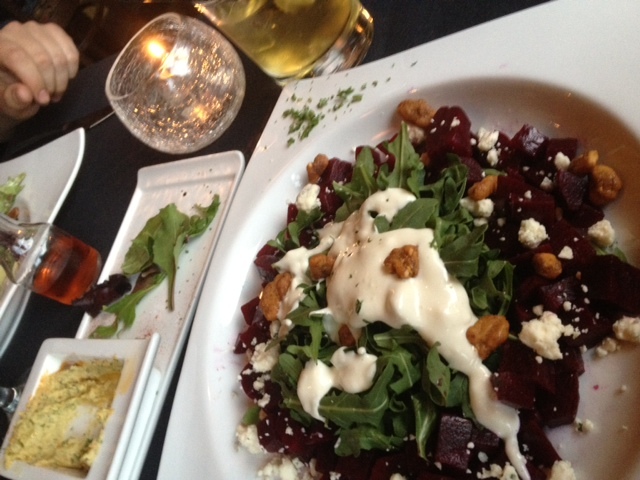 I thought the beets were delightful in the salad, but the salad didn’t need to be so bathed in heavy Blue Cheese dressing…even though I do LOVE blue cheese. Jason’s Pork Filet Mignon, which was served with mixed veggies, purple cabbage and mashed potatoes, he found to be good but not amazing…however, good enough to eat all of it before offering me a taste… The Grilled Beef Tenderloin was served with a Parmesan risotto and mixed veggies. I actually really liked the skewered meat – very tender and the melted blue cheese on it was tasty. As for the sides, I could live without. At the end of the meal we decided to skip dessert here and high-tail it over to Jeni’s for some real original flavor. (Man, I’m glad that the German Village location opened back up last Friday!) Is the food bad at Sidebar 122? No. But is it original, competitive or even well representative of the cuisine that C-BUS has to offer? The answer to that question is NO as well. I will say, however, that I do plan on going back sometime just to sit and drink at the bar…word on the street is that they give you BACON instead of peanuts to snack on! Just like at a hotel that I am staying at when traveling – I’d rather grab some drinks there than eat there, any day of the week. Posted in All, Cocktails/Drinks, Dinner, Restaurant Spots and tagged Columbus classic cocktail, Columbus happy hour, Columbus restaurant, downtown Columbus, Opentable, Sidebar 122, Sidebar 122 Columbus. Bookmark the permalink. Easton is no Eden, but I do LOVE Cafe Istanbul! One of the GREAT things about starting this food blog is that it offers me a wonderful excuse to revisit all of my favorite places. Why not go to the places I love & eat all of my favorite meals, snacks and/or desserts that have brought my taste buds and tummy such joy?!? 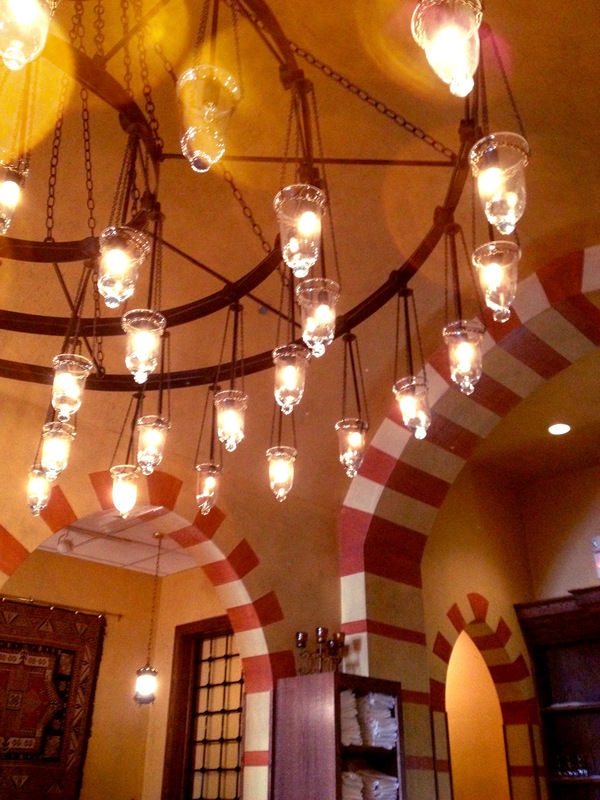 A recent trip took me back to Cafe Istanbul in the Easton shopping complex in Columbus & it is, believed by me, to be the best restaurant in there. After all the chaos of trying to even get to Easton, yet alone park, it is always a delight to just step into this restaurant it’s like stepping into another world & always brings me such elation. You’ll find areas that almost act like little seating cubbies vs. separate rooms, off to the sides of the main seating area. The tables look bistro style, they have the most spectacular chandelier hanging in the main hall, and fantastic Turkish decor displayed throughout. But while I love the atmosphere @ Cafe Istanbul, it’s the staff and especially the food that keeps me coming back for more. The moment that you sit down you will be served the most amazing Turkish bread, called pide, and a dipping sauce, is kind of like tomato & spice mixed with oil, that will knock your socks off (not because it’s spicy, it’s actually kind of sweet & savory at the same time…but the taste is phenomenal). Once this hits the table I find it hard to stop eating it until it’s ALL gone and if even one other person is with me for a meal here, then we will certainly need second helpings of both. With that said, the pide also disappears quickly because I always order hummus here and enjoy soaking it up with the bread. Traditionally, I always get the chicken kebab for my entrée, but on this day I decided to mix it up a little and try the Kebab Combination. With the kebab combo you get to pick two kebabs from the menu and get a half portion of each, so I chose the chicken and dÖner kebabs. The dÖner is like gyro meat, hand-carved marinated lamb and beef that is grilled on a large, vertical rotisserie. The chicken was good, as it always is – NEVER over-cooked, just juicy and delicious. Now the dÖner was even more AMAZING. The marinade they used was incredible and every bite of this meat combo was more flavorful than the last. I will never pass up the chance for more dÖner at Cafe Istanbul again. The kebabs also come with rice and grilled veggies; and there is enough food for two people (if you are interested in sharing or taking some home for another meal). 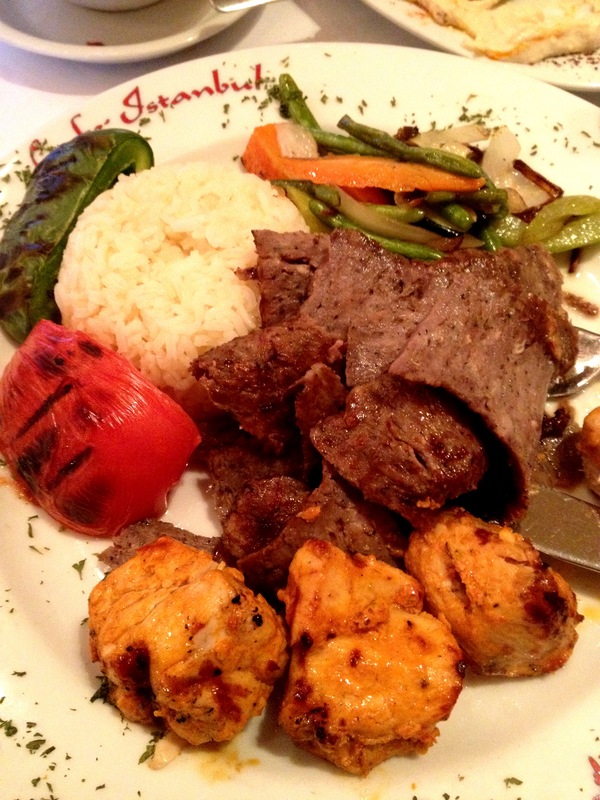 I will definitely be coming back to Cafe Istanbul many more times – I promise you that you will not regret doing the same thing. I give Cafe Istanbul TWO thumbs up! Posted in All, Appetizers, Dinner, Restaurant Spots and tagged Cafe Istanbul, Cafe Istanbul Columbus, Columbus restaurant, Easton restaurant, eat and shop columbus, Mediterranean restaurant Columbus, Turkish restaurant Columbus. Bookmark the permalink. The expression is ‘cook with love’, not ‘bake with anger’… The Angry Baker misses the mark! I believe the expression is to ‘cook with love’, but there is nothing about baking with anger and I can only think that this is why…the results are NOT good. This is a new kind of post for me, a post of disapproval. My father instilled in me a loyalty to small business or mom & pop spots and I have carried that with me as I moved out on my own. I think I pay a lot of attention to where I’m purchasing from, what I’m purchasing and making sure that I’m not supporting places that do not share my values. (It’s why you’ll never hear me saying I wish I could shop at Walmart or that I miss shopping at Whole Foods, Target or Best Buy- cheaper doesn’t mean better and there is always a cost to another for that couple bucks you are saving.) I try not to eat at large chain restaurants (I did say try, NOT that I NEVER do…) and I really love the work that Ohio Proud (www.ohioproud.org) is doing so that I can support Ohioans like myself and small businesses as much as possible. So it is with a heavy heart that I blog about one such place that just does not seem to have it together and whose staff do not seem to care. But that’s neither here nor there on a food blog, the food is the actual important part. The sandwich did have delicious tomatoes on it and the bread was fantastic as well, but from there it all went downhill… Sadly, the bread slices were thicker than the whole rest of the sandwich, there was barely any turkey or cheese but there was a good inch of whole grain mustard on it (enough for a good 10 sandwiches at least & nearly impossible to scrape enough off- and I really like mustard too). For eight dollars I expect a little more. Especially when you have Black Creek Bistro down the street or such sandwich options in the city as Brown Bag or Danny’s Deli… So today I give my first two thumbs down, but with the hope to one day write that I was wrong and that there is a reason to stop by and patronage the Angry Baker. Posted in All, Desserts, Lunch, Restaurant Spots and tagged Angry Baker, Columbus lunch spots, Columbus oh bakery, Columbus restaurant, downtown Columbus, Dr. Pepper cake, Olde Towne East. Bookmark the permalink.